Welcome to your last trimester of pregnancy! When you’re expecting a child, the amount of “getting ready” that your doing is overwhelming. You are suddenly going to be responsible for another little human–oh, and you’re expected to be fabulous at it. Bottles and bibs, diapers and clothes, car seats and cribs. If only that were all it took to make your transition from wild nights to early bedtimes easy. I am an obsessive planner, and so I scoured the web to make sure I had everything ready for my little one’s arrival. I did a pretty good job, but there were still things I didn’t do that would’ve made my life with a newborn easier. Not only that, but some of the stuff I prioritized ended up being utterly pointless. Motherhood is full of trial and error. I promise you will get used to the chaos. There is a reason our species has survived, and I doubt you are the exception to the rule. 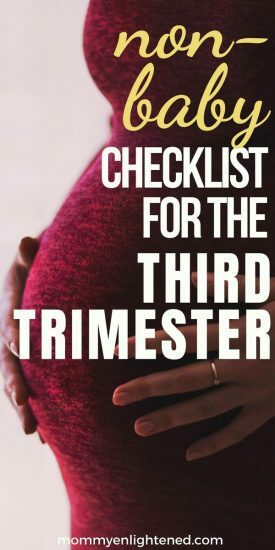 This post is a list of NOT baby-related things you need to get done in the final trimester of pregnancy. 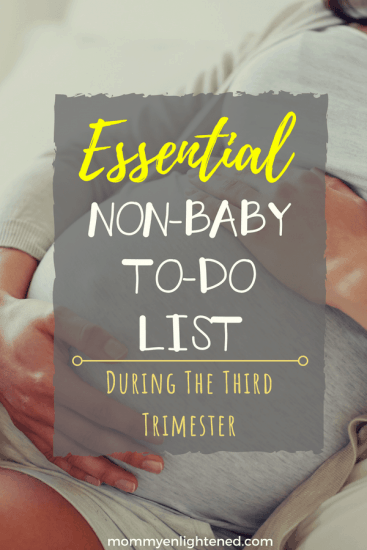 If you need a checklist of baby things to do during the third trimester, I have that too! There are affiliate links in this article. You can read more about this in my disclaimer. Trying to get your body back to normal after childbirth is HARD. It ends up being a LOT of hard work for some moms, so you need to set some realistic expectations for yourself. Working out with a newborn feels next to impossible (which is why I didn’t do it!) but you will feel better about yourself if you get active. Katie is a pre and post-natal exercise specialist and nutritionist that sells a course that solves for things like regaining your core strength, fixing your pelvic floor, and figuring out what you should eat to help encourage faster healing. Also – her course has an app which is an awesome perk for most of us who do things on our phones. She has plenty of printables to go along with it, and I truly believe in the value she is providing. You can find out more about her course here. It’s called nesting–embrace it. The amount of stuff you will obtain when you have a new baby is ridiculous. If this is your first and you are like me, you are probably excitedly purchasing everything in sight (obvs so you don’t forget ANY of the essentials). First off, I can tell you that there are a lot of items you can do without–but you often won’t know this until you are in the throw of things. Although we had a crib and car seat prepared for our new little one, we didn’t put a lot of thought into where we would put everything else. Our baby had her very own room–but honestly, we did not spend a lot of time in her room for the first few months. You will still need to be in all of the same places you were before the baby was born, but you’re going to have an extra human’s stuff to tote around with you. Look at everything you haven’t used in the last six months and decide if it’s worth keeping around. Have a garage sale, donate to the homeless shelter, and make sure your baby’s things can be easily accessible. Try and have as much of this set up as possible before your baby is born. Recently, a blogger friend of mine shared with me a new Postpartum Healthy Eating e-book that she created. Honestly, I LOVED it. It’s super affordable and a TON of good information regarding how to pick quality healthy foods, as well as personal recipes she has used herself. This girl did a TON of research to find the healthiest eating options to help you keep your strength up while nourishing your body. I definitely recommend checking it out. When searching for different ideas, try and keep in mind that meals you can eat one-handed or standing are going to be more beneficial for you. Purchase a multitude of healthy snacks, since between a needy baby and sleepless nights you may NOT have the time to heat up your meal like a proper human being. Sorry. It’s just the way it is. In these situations, you don’t want to be stuffing your face full of donuts and coffee; remember mom, moderation is key. Disposable paper plates, cups, and silverware can be your friend as they help minimize the amount of clean up you have to do.
. This thing is probably one of the only reasons I ate the first few weeks after my baby was born. There is an area to fill out a grocery list, as well as daily and weekly meal plans. I love organized lists and so this was perfect for me. It makes all of the difference in the world to have one less thing to worry about. You should also update your list of delivery restaurants in your area, because if you are like me, you will end up eating A LOT of takeout. I get being healthy is important, but surviving is MORE important so do what you need to do. You don’t want to be toting around a newborn into a veterinary clinic for a while (just trust me). Get your pet’s yearly appointments and any other procedures done now. When was the last time Fluffy had a dental done? Also, you need to make a plan for what you will do with your pets once you go into labor. Will a friend take care of them? Will you board them? Okay, so this is technically kind of baby-related. However, labor, delivery, and breastfeeding are JUST as much about you as they are about your baby. The easier you make the whole experience on yourself, the easier it will be for your new littles. For breastfeeding, Stacey from Milkology has a fantastic course I would recommend. She’s a lactation consultant with plenty of education and experience in breastfeeding, and she really goes into depth about the science behind it. This course is kind of your one-stop-shop for breastfeeding related stuff, so it’s definitely worth considering. My hospital had a labor and delivery course, but I had no interest in going out in public when I was eight months pregnant. I wanted to sit on my couch. So, I did some research and found that there are online labor courses you can take. Hilary from Pulling Curls has one of the only labor and delivery courses I would highly recommend. Hilary is a labor and delivery nurse–so she definitely knows what she’s talking about. She also has a private Facebook group so you can ask her some one-on-one questions if you need to. Get your carpets cleaned, wipe out your kitchen cabinets, and deep clean the bathrooms. Don’t expose your brand new human to the world of whatever germs live in your carpet. They already are at a disadvantage with their weakened immune system, so you need to take keeping your home germ-free pretty seriously. At least for the first little while. Also, keep in mind you will have VERY little time for cleaning once your baby has arrived so get it done now! The average low-risk first-time mother doesn’t go into labor naturally until the 41-week mark. Unless you have a preexisting condition that may cause you to go into labor early, you are probably safe to have your bags packed at the eight-month mark. I packed my bags with my first at six months, but I also had to repack a few times because I kept adding additional items for the baby. Those maternity clothes are going to be too big for you after you pop out your little one, but you also won’t be able to fit into your regular clothes for the next 6-8 weeks. You end up being in this weird limbo where you struggle with feeling like you have a real person’s body. It’s doughy, dumpy, and it feels totally unnatural (but it’s not). I ended up walking around in sweats all of the time–not great for self-esteem. It doesn’t matter how comfy they are; studies have shown that you will feel better mentally if you take care of yourself physically.
. I bought a couple of different outfits with my second, and it helped me feel more like myself. Self-care is essential, especially after the birth of your baby. I have a spreadsheet where I calculate all of our bills once a month. When I was eight months pregnant, I wrote out our spending plan for the following six months. We did pretty well with sticking to it, except for a couple of to-die-for baby jumpers that my daughter really needed. Also, if your bills aren’t on auto-pay already, set it up! Think of it this way: you have to pay it anyway, so why not remove the burden of doing it manually? Sometimes companies will offer incentives for using their autopay; our phone company charges us fifteen dollars less a month because we use auto-pay. Plus, you can always cancel the autopay if it doesn’t work for you. Remember, every time someone holds your new baby they should be washing their hands. I use Clorox Wipes for everything–even carpet. Maybe that isn’t their intended use, but they work just as well as an expensive carpet cleaner at getting out poop stains if you ask me. Both of my babies were born during RSV season, which meant we pretty much lived at home for the first couple of months after they were born. Babies are a lot of work, but there are times where you will have time to relax, which will probably surprise you the first time it happens. The baby will fall asleep in your arms, and you won’t be ready to put them down and risk them waking up. These are the moments that you need to steal for yourself, which is why you should stock up on quiet activities you can do with minimal movement. to read while my husband played Final Fantasy on his gaming system. The Kindle was convenient because I didn’t have to balance a chunky textbook and sleeping baby at the same time. Plus, the lighting on an e-book tends to be less bright for a baby. For you it may not be books or video games. That’s perfectly okay, just find something. Once your baby arrives, your entire life will be absorbed by your tiny little love for the first few months. Your other relationships with likely suffer–which is okay. People usually understand when you want to spend time bonding with your baby. If you have a partner, make it a point to go out on a few special dates before the arrival of your baby. I know it can be hard to traipse around with a nine-month pregnant belly, but you won’t get this chance again for a while. A long while. With my first child, my fabulous coworkers sent us to a fancy little hotel in the city for a night, and we had a lot of fun–a sort of “our lives are ending” celebration. Don’t forget about your friends, either. Block out your calendar and plan dates with the different people that you may not get to spend time with for a while. Although I planned date nights with my husband, I wish I would have made a point to spend more time with friends as well. If you have other children, plan a couple of quality time activities together. I took off a few weeks before my second child was born, and I am so glad I did. My toddler and I went out almost daily, and we had a perfect time just being together. Are you going to be due for an eye exam or the dentist in the next few months? Schedule these appointments and get them out of the way, so you don’t have to worry about it for a while. I had my wisdom teeth removed a couple of weeks after my daughter was born, and I was miserable. The only exception to this is if you have a January baby. In that case, it may be beneficial to wait since you will be much closer to meeting your deductible the year you have your baby. There are plenty of things in your home that you can’t have too much of. Think of things like toilet paper, batteries, or dishwasher soap. Look at what your family uses on a weekly basis and make sure you have a couple month’s worth of these items. I mean it. Your life is about to change, and you deserve to do something for yourself. If you struggle to think of something you can do for you, this is a great list of self-care ideas for moms. 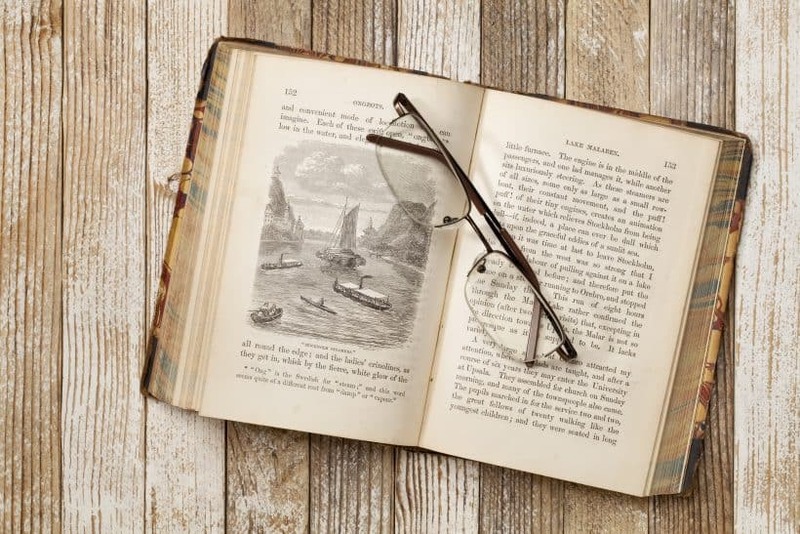 Joanna shows us that we don’t need to do anything fancy–little things will improve your mood greatly. Try and think of the things you do for yourself to feel good, and make time for it. tough not to feel anxious and overwhelmed by everything that is going to change, but remember to live in the moment a little. When you are going through your day, do things mindfully and with meaning. The time will go so quickly, and you want to make sure you can look back at this time in your life with positivity. What about you? What non-baby stuff have YOU been doing to prepare yourself? I would love to hear about your experience in the comment section below. If you enjoyed this post, please share or pin it for later!